Back by popular demand! 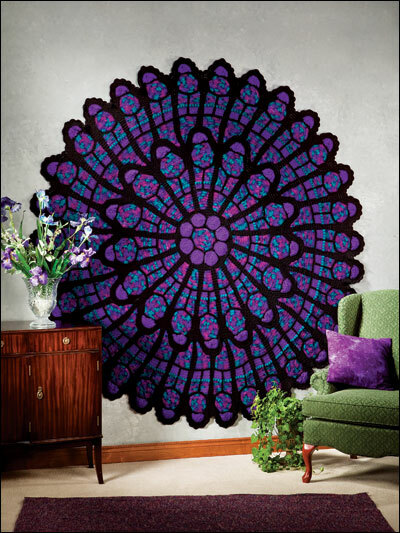 The Cathedral Rose Window crochet afghan pattern will enliven any home. 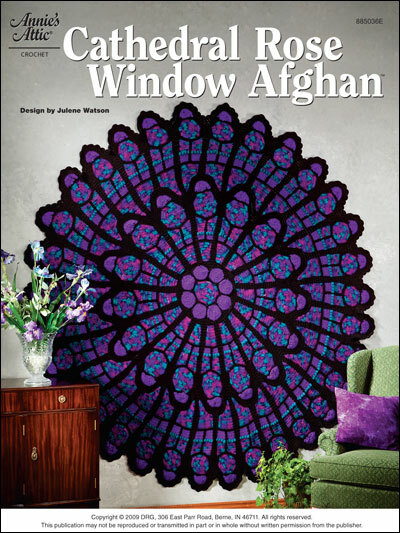 We took this award-winning crochet afghan pattern and updated it with modern colors. And we think it's still a winner! Crochet this afghan for yourself or as a gift. It would be a perfect -- and very special -- wedding present. Made with worsted-weight yarn. Approximately 78" in diameter. If must be me But I find this pattern confusing- the colors listed do no match the pattern Picture The Instt. are hard to follow The assemble leaves alot to the Imagination What does it mean - changing color to match color sequence of last m d. I have been crocheting for many years. This makes no sense. I have made two of these (both gifts, want one for myself!). The only problem is acquiring the correct yarn. If you order the jewel tone yarn in the larger size skein, the colors are muddy. I found that you need to order the smaller size to get the correct color. Lion Yarn had no answer as to why the size of the skein made a difference in color but did agree that I was right. Take your time with this pattern and you will be pleased. I won first prize at the Duval County fair a few years ago with this afghan. I have just finished this pattern and absolutely love it! I posted pictures of my finished Afghan on several Crochet Facebook sites and I am just overwhelmed at the amount of comments and likes I have received, well over 20,000! Do not let this pattern scare you into thinking you cannot do it. It is a perfectly written pattern and not nearly as hard as it appears to be, although it is not something you are going to finish in a couple of weeks, the time you put into it will be rewarding. I don't like the filling of the valleys, there are holes and it's very uneven, and I am a neat crocheter. Do other people have the same problem? I love the pattern! At the moment I am in the middle of the second section but I find it very difficult to work only with written instructions. Do you have a chart available? I find them a lot easier to follow. Ulrike - We're sorry, but a chart is not available for this pattern. We are happy to help you with any questions about the pattern so please contact us at Pattern_Services@Annies-Publishing.com if you need help.